Retired CIA operative Frank Moses (Bruce Willis) lives a life so lonely that he pretends he doesn’t receive pension checks to allow him to flirt with Sarah Ross (Mary-Louise Parker), the phone operator. He tries to move this forward with a visit to her base in Kansas City and a nerve-wracking in-person meeting. Before this occurs, however, Frank’s past comes back to haunt him. A team comes to kill him, but he manages to take care of them and escape. He heads to Kansas City to keep Sarah out of harm’s way, as he assumes that the assassins will recognize a connection via their phone calls and come after her. As I alluded at the start, Red easily could’ve turned into nothing more than a high concept gimmick. Usually when a movie features old people playing young folks’ games, they tell us that age doesn’t matter but also show the elderly in ways that make them look foolish. We don’t get that double standard in Red. It uses the characters’ ages for thematic resonance but not for laughs. Instead, we see the characters as strong and active. Sure, the movie accentuates the notion that age-based retirement may put some valuable people out to pasture too soon, but that’s not something portrayed in the semi-hypocritical manner to which I earlier alluded. These aren’t goofy oldsters who dare to think they can play ball with younger combatants. They’re awesome operatives who just happen to be a bit older than usual. But that’s not the movie’s primary appeal. Instead, it’s the caliber of the actors in place that brings a buzz to Red. We get a simply outstanding cast here, with four Oscar-winners via Morgan Freeman, Helen Mirren, Ernest Borgnine and Richard Dreyfuss as well as talents like Willis, Parker, John Malkovich and others. That’s a high-octane crew, and they bring an awful lot of heft to the experience. On one hand, Sarah acts as a way to prompt a lot of action and to add danger. After all, we fear more for her safety than for those of the old pros. She’s the amateur more likely to get caught in the crossfire, and the movie uses her in the expected “damsel in distress” manner. Sarah also needs to ensure that we get a lot of the story and character exposition. She helps fill in the blanks that otherwise wouldn’t need to be explained from one veteran to another. The other actors also deliver fine turns in their roles. Few need to stretch, but they seem invested and enjoyable. In particular, Malkovich relishes his role as the gang’s nutbag. His Marvin is both kook and badass all at once, and Malkovich walks the line between those two sides in a delightful manner. Director Robert Schwentke helps keep things together, and the movie comes with a surprisingly coherent plot. Flicks like this often become bogged down in their twists, but matters remain reasonably tight here; we never feel lost or befuddled by narrative matters, and Schwentke ensures that the flick cranks along at a good pace. Red appears in an aspect ratio of approximately 2.40:1 on this 4K UHD Disc. This was a mostly appealing presentation. Overall sharpness worked well. Some softness crept in at times, but the majority of the flick seemed well-defined. I noticed no issues with jaggies, shimmering or edge haloes, and source flaws were absent. This was a grainier than average image, though. Colors seemed satisfying – and the movie went with a surprisingly natural palette. Oh, I noticed a teal tint here and an orange tone there – especially during the film’s climax - but the flick was usually fairly straight-ahead in terms of hues. They tended to be solid, without runniness or other issues. Blacks were tight and firm, while shadows looked concise and clear. This wasn’t a killer presentation, but it represented the film in a satisfying manner. As one expects from a big action flick, the Dolby Atmos soundfield – downconverted to Dolby TrueHD 7.1 on my system - opened up in a dynamic manner. The many action sequences used the channels well, as vehicles, gunfire and other elements fleshed out the room in a compelling manner. The track used the surrounds in an involving way and made them active partners in the mix. Audio quality always seemed strong. Speech came across as crisp and concise, without edginess or other concerns. Music sounded lively and full, and effects were well reproduced. Those elements seemed consistently accurate and dynamic, and low-end was tight and deep. All in all, this was a more than satisfactory soundtrack. How does the 4K UHD release compare to the original 2011 Blu-ray? Audio showed a bit more movement and punch, while visuals were more accurate and natural. The limitations of the source meant this didn’t become a great improvement, but the 4K UHD provided the more satisfying reproduction of the film. A full roster of extras appears on the included Blu-ray disc, but a few also appear on the 4K UHD disc. I’ll note materials that show up on both with red print. We find an audio commentary from movie consultant/retired CIA field officer Robert Baer. He offers a running, screen-specific chat that occasionally discusses aspects of the movie and his work on it. However, Baer usually concentrates on his life in the CIA. 10 Deleted and Extended Scenes occupy a total of eight minutes, 46 seconds. Most of these simply add a little to existing sequences, so they’re not especially memorable. I do like the piece in which Marvin gripes about being called old, and we also see a little more about Cooper’s home life; those snippets would’ve added a bit of depth to the flick’s climax. Most of the cut pieces are pretty superfluous, though, and they’re too brief to make a positive or negative difference. The Blu-ray disc opens with an ad for Fair Game. The 4K UHD disc also includes the trailer for Red. 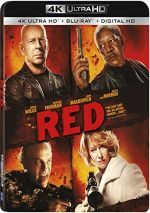 A delightful action flick with a “high concept” twist, Red is a winner. It comes with a fun story, an excellent cast and a general sense of excitement that make it a consistent pleasure. The 4K UHD disc offers largely positive picture along with excellent audio and a generally informative set of supplements. While this won’t be the 4K UHD disc you use to impress friends, it does become an upgrade over the Blu-ray.